a store in another country, FYI, the Xiaomi is now available on Amazon US. There are at least two listings for the Xiaomi, listing 1 and listing 2, currently for $329 and $299 respectively. These listings are significantly more expensive than Gearbest, which is currently $206.11. Why would you order from Amazon? First, they can ship faster than Gearbest, and second, they have a more lenient return policy. Also, listing 2 has a US warranty. So if there are problems, it will be easier to resolve them through Amazon or the local distributor. To me, those benefits don’t offset the increased cost, but at least you have a choice now. Meanwhile, pls. check out my video review and sample below, and please check out the Facebook Mi Sphere group for many user samples. Since then, there have been many improvements to the Mi Sphere as noted in my detailed review. 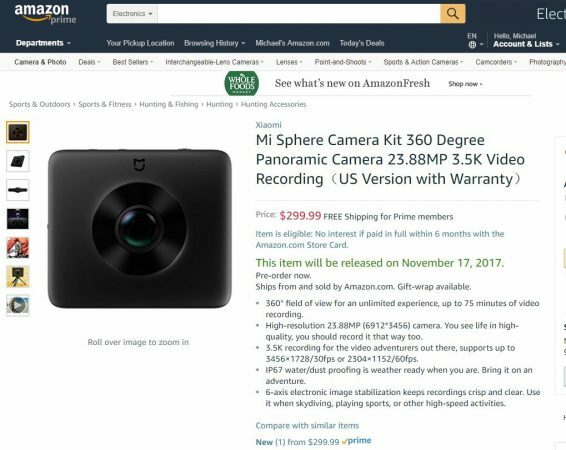 Rylo Camera’s Amazon reviews: real or fake?